A professionally executed bathroom remodel can increase a property’s value and substantially speed up sale. Nevertheless, if you want to get the biggest bang for your remodel buck, there are a few points you should bear in mind. If handled in a slapdash manner, some bathroom updates could go amiss or cost you more than they’re worth, which is why you should stick to tried and tested design tips if you want to stay on the safe and sleek side of the remodel agenda. Before you barge into the bathroom wielding sledgehammers and power drills, take the time to draw up a framework cost assessment and see how much cash you can set aside for the project. This will help you avoid needless expenses and get a better image about the scope of the update and trendy bathroom changes you can actually afford. The lighting scheme that brings out your bathroom’s finest features is another remodel aspect you should bear in mind when planning the update. As a rule, layered lights featuring equal doses of ambient and task lighting will work nicely in most bathrooms, and you can also throw in accent and decorative lamps for bonus aesthetic points. To maximize the efficiency of the remodel, it may be a wise idea to get familiar with dimensions of key fittings such as the bathtub, toilet, and sink. Based on the measurements, it will be easier for you to draw up the floor plan and find a way to rearrange your bathroom in line with peak functionality and aesthetic value. A vintage bathtub will add an aura of old-school luxury to your bathroom, but unless you intend to use it on a daily basis, you may want to consider swapping it for a classic shower. The simple cost-efficient and space-saving adjustment will come in as particularly useful if your bathroom is on the smallish side. If you really can’t go without a full-scale bathtub, consider upgrading to a standalone bath for an extra dose of aesthetics and functionality. Freestanding stone baths are a hot trend in the world of bathroom design at the moment, and they will go well with most contemporary fittings and trending colorways. If your bathroom isn’t exactly generous size-wise, it may be a smart decision to move the sink to the corner to avoid traffic hitches. Of course, changing the bathroom layout will call for a partial or complete plumbing overhaul, which will in turn dial up total update costs and extend remodel duration. 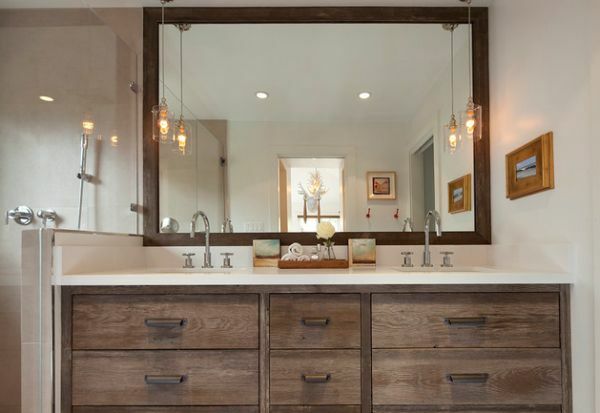 Wood is one of the organic materials that made a loud entrance on the bathroom design scene a while back, and it’ll probably stay in vogue in the years to come. Nevertheless, if you wish to introduce timber into your restroom, you should pay attention to the wood-tile transition points to prevent excess humidity buildup and costly post-remodel flooring repairs. Before you buy those king-size tiles with a fancy print, pause to take a quick glance at the overall bathroom look you’re aiming to achieve. It would also be a wise idea to double-check tile types and dimensions to make sure they’re a perfect bathroom fit in terms of target décor, grout joint size, and restroom dimensions. Few things look worse that a bathroom where the toilet is the first thing you see when you open the doors. To prevent your toilet bowl from turning your bathroom into an eyesore rather than a functional room in your house, move the toilet bowl to a corner behind the door or conceal it by a mobile room divider or tall potted plant. Are you ready to remodel your bathroom and boost your home’s value and functionality? Follow the tips listed above and your private hygiene haven will soon become as sleek, snug, and stylish as you always wanted it to be. Good luck!